Flint corn (Zea mays indurata; also known as Indian corn or sometimes calico corn) is a variant of maize (var. Linnaeus), the same species as common corn. Because each kernel has a hard outer layer to protect the soft endosperm, it is likened to being hard as flint; hence the name. With less soft starch than dent corn (Zea mays indentata), flint corn does not have the dents in each kernel from which dent corn gets its name. 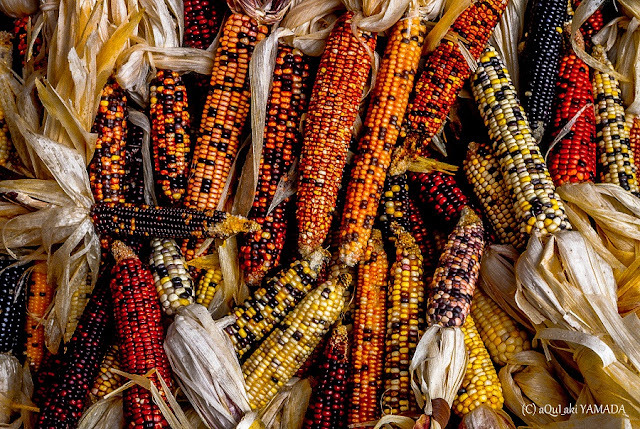 This is one of the three types of corn cultivated by Native Americans, both in New England and across the northern tier, including by tribes such as the Pawnee on the Great Plains. Archeologists have found evidence of such corn cultivation by the Pawnee and others before 1000 BC. Cultivation of corn occurred hundreds of years earlier among the Mississippian culture people, whose civilization arose based on population density and trade because of surplus corn crops. When fully ripe, dent corn has a pronounced depression or dent at the crown of each kernel. Flint corn kernels lack these depressions. Because flint corn has a very low water content it is more resistant to freezing than other vegetables. It was the only Vermont crop to survive New England's infamous "Year Without a Summer" of 1816. The coloration of flint corn is often different from white and yellow dent corns, many of which were bred later. Most flint corn is multi-colored. Like the Linnaeus variant of maize, any kernel may contain the yellow pigment zeaxanthin but at more varying concentrations. Popcorn (Zea mays everta, "corn turned inside out") is considered a variant of this type. It has a hard, slightly translucent kernel. Flint corn is also the type of corn preferred for making hominy, a staple food in the Americas since pre-Columbian times. The flint corn cultivars that have large proportions of kernels with hues outside the yellow range are primarily used ornamentally, notably as part of Thanksgiving decorations in the United States. They are often called either "ornamental corn" or "Indian corn", although each of those names has other meanings as well.